“About midnight, residents throughout the city were jarred by the roar of jets. From S.A.C., Lock- burne AFB, south of Columbus, the Air National Guard jets were alerted, scrambled and were over Cincinnati in 12 minutes. 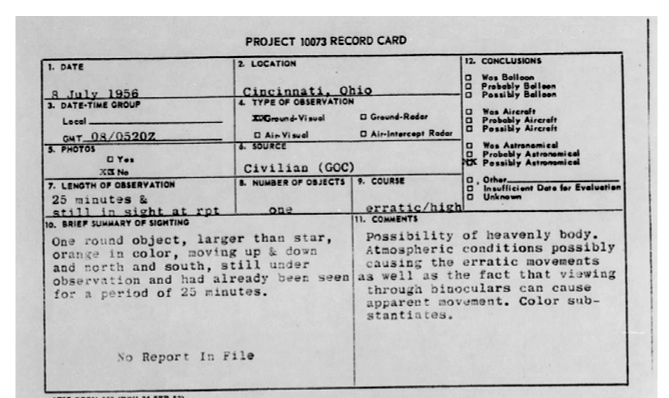 The alert began when three UFOs were sighted and confirmed by radar somewhere between Columbus and Cincinnati. area. He said the UFOs had been active over Mt. Healthy and could be seen clearly by observers from the tower. In a short time, the jets, at approximately 20,000 feet, were over Cincinnati, but poor visibility prevented me and a visiting friend from Toronto, Canada, from seeing the UFOs which had deployed over a wide area. According to radar, the interlopers had extended 37 miles south, 24 miles north of the city, and as far as 10 miles east of Mt. Healthy. Stringfield added that a Cincinnati reporter had contacted the USAF and they had denied the incident had transpired. One would think if these jets were really flying over the city, the news media would have reported it. Various authors, who like to list these stories in their databases or books often list multiple sources to give the story strength. This is misleading because they tend to cite each other with the real source being the NICAP document, which uses Stringfield as their only source. None of the Ground Observer Corps, pilots, or radar operators mentioned by Stringfield appear to have ever been interviewed. It is interesting to point out that this is less than a month after the August 23rd incident. One can speculate, based on this bit of information, that no UFO report was filed for the event because the GOC made a mistake that night and did not want to record it. It is even possible that, to prevent any future mistakes, the USAF may have selected Stringfield to help prevent the GOC from unnec- essarily sending jet fighters to intercept UFOs that turned out to be nothing more than stars or planets. 25 minutes. It does not sound like Stringfield helped much on that report due to the lack of information in the file. The source of the report probably was astronomical. About one hour before the report was made, the planet Mars, two months from a very close opposition, rose in the east at magnitude -1.3. At that magnitude, it would have been “brighter than any star” in the sky and a likely stimulus for UFO reports. The events transpired EXACTLY as Stringfield described. The events are an exaggeration of what transpired. It could have been some form of misperception, which resulted in a “scram- ble” of fighter jets but they could not find the targets identified by the GOC and radar. There may not even have been any radar contacts. I don’t think Stringfield made it up and I don’t think Stringfield was entirely accurate in telling the story, which makes some form of number 2 the most probable. The bottom line is that the story is anecdotal and hearsay. It cannot be verified and is not good evidence. Hall, Richard M. (Ed.) The UFO evidence. The National Committee on Aerial Phenomena (NICAP). New York: Barnes and Noble. 1997. P. 135.